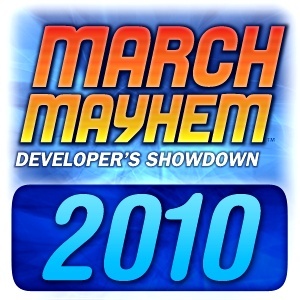 Welcome to The Escapist's 2010 March Mayhem: Developers Showdown. 64 developers from around the world have been chosen to go head-to-head in a bracketed tournament to see who will win the title. Developers will be relying on your votes in order to progress through the tournament and take home the March Mayhem title. The voting begins March 17th and lasts until April 8th, after which the winner will be announced. Participants in the tournament will have a chance to win some awesome prize packs, provided by our sponsors Astro Gaming and Gunnar Optiks. For those of you who participated in last years tournament, welcome back to the Mayhem and please note a few rule changes below. For those of you entering March Mayhem for the first time, buckle up, you are in for quite a ride. It's easy to join in March Mayhem. First, simply register for a free Escapist account by clicking here, or log in using your Facebook account. Creating multiple accounts will result in all of your accounts banned and all votes negated. Once you've logged into The Escapist, fill out your bracket here. Keep in mind that filling out the bracket does not automatically cast your vote. Click on the "VOTE" button from our main bracket page, and a match-up page will pop up. Go through the list and vote on each of the match-ups, then head over to the forums to chat! Please note, if you only want to vote in a couple match-ups, please use the forums instead to make it easier on yourself. Voting is also available in each match-up thread in our official March Mayhem forums or click on any match-up from the bracket page to be brought to that particular thread and poll. Each round lasts 48 hours. If there is a tie, the match-up will have another 24 hours of open voting until a winner is announced. On March 17th, you can begin casting your votes. Below is a schedule for each round, with all rounds starting at approximately noon EST. Make sure to cast your vote for each round! As mentioned above, we have some awesome prize sponsors this year and they are bringing uber prize packs with them! Click on the links below to check out their site and see what you could win! Tweet any of your match-up choices using our tournament link http://bit.ly/aANIUR and the hashtag #escMM. You must tweet referencing the developer's Twitter account. For example, if you voted for Bethesda, you may tweet the following: "I voted for @Bethblog in Round 1 of The Escapist's March Mayhem: http://bit.ly/aANIUR #escMM." For a list of the official developer Twitter accounts, click here. You will get one extra vote for each match-up you tweet about per round, as well as an extra entry for a prize. For example, if you tweet about picking @Bethblog in round 2, Bethesda gets an extra vote in round 2. If you tweet about more than one developer, each developer gets an extra point. That means in Round 1, you can earn 32 extra points for individual developers and 32 entries for a prize pack. Please remember, you MUST update your Escapist profile with your Twitter username or we can't track you. If we can't track you, none of your tweets will count. To sign up for your free Twitter account, click here and make sure to follow @TheEscapistMag. Post on our wall and let us know your username and which developer you're hoping will win the Mayhem. This must be done BEFORE The Great Eight (Round 4) begins. This will grant an extra vote for that team if they end up in the final match-up. also, posting here will get you entered into yet another random drawing from one of our prize sponsors. Please remember to post your Escapist username on our Facebook page so we can track you. If we can't track you, you get nada. There will be many visitors from communities all over the world showing up for this event. Show them around, help them out and be nice. We encourage everyone to show support for the developer of their choice on the forums. Cheer loud and often and even feel free to debate but do not make it personal or nasty. Flaming or name calling directed towards a user will get you automatically put on probation and your vote for that round will be negated. If it happens a second time, your account at The Escapist will be revoked and your vote as well. Keep in mind that creating multiple accounts will also result in a ban. Please remember, The Escapist is a safe place for everyone to hang out, regardless of what type of games they play or what their interests may be. The staff here works overtime to maintain that balance to the best of their ability. If you feel yourself getting into a heated debate, walk away from the keyboard, collect your thoughts, and come back when calm. If someone takes a personal shot at you, please use the "REPORT" button so our moderators can investigate it further.